Pickup trucks are a great way to travel local and long distances for plenty of reasons; here’s why, with most pickups you can haul trailers, cars and more depending on your truck’s performance. The ability to tow or even plow in the winter months makes up for the decrease in miles per gallon versus a sedan. Newer trucks are actually getting better gas mileage as well, so there’s even more reason to make the switch. 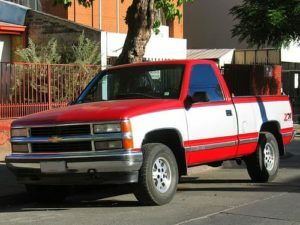 Having the extra height of a pickup makes it easier to work on if you decide that you want to change oil, replace parts, etc without the hefty price tag at an oil change business. Let’s not forget that driving a pickup is just a fun experience overall from tailgating at your local stadium before a game to going on an off-road adventure in the country. There are three types of cabs that are available to choose from when looking at purchasing a truck. Regular cab, extended cab and crew cab may seem confusing, but are really simple to identify and decide which fits your needs. Regular simply means that there is no second row of seating, so it’s just the passenger and driver. Extended is having a second row of seats, but not having doors to access those seats and is used more often for storage then passenger transport. Crew is the second row of seats are full and able to accommodate passengers well with their own door access. The two trucks detailed below are both excellent starter pickups, but if you can find one with similar qualities that is used and maybe an older model to save money, that would work just as well. The main features to look for in your first truck are: automatic transmission, a 6-cylinder or 8-cylinder engine, two door and the extended cab style. Extended is a great cab to start with because you get an overall feel for what you will use the truck for and it’s smaller than a crew cab. Start your search for a better driving experience today.